Just a few miles from Marbella and Puerto Banus lies Sitio De Calahonda, in Mijas Costa. Our popular ground floor air conditioned apartment nestles in a prime and peaceful location in lush Mediterranean / tropical, beautifully kept gardens. There are three well kept pools, our apartment overlooks one of them. The apartment boasts a 42 inch flat screen smart TV, Superfast unlimited fibre optic 100MB Broadband. Full UK National, freeview HDTV also with International stations with over 160 channels in all. DVD, Blue Ray/ CD , virtual surround sound blue tooth sound bar, linking your music devices Loads of DVD movies. We have electric gated car park and the apartment is furnished to a high standard. With a fully fitted kitchen with kettle, toaster, juicer, fridge, coffee maker and electric hob & oven, micro wave, washing machine. There is ample china, cutlery and cooking utensils etc. Iron & board & bedding for 1 double and 2 single beds, cot, and spare folding bed, hand & bath towels are provided, please bring your own beach towels. There is a large well furnished patio. Overlooking 9th tee of La Siesta Golf Course. 3 sets of right hand clubs, 2 carbon shafted 1 steel Lynx and Callaway are provided in the apartment. Close by is tennis club with squash, sauna and gym. Please scroll down for availability, rates and reviews. Extra Facilities: Our apartment for rent on the Costa del Sol in Sitio de Calahonda is ideally positioned for many activities, like golf, tennis, swimming pools, water parks. There is plenty to do and see within a short distance. Situated overlooking La Siesta Golf course and surrounded by many premier Costa del Sol golf courses. A fabulous tennis club with state of the art gym is Just a 300yd. walk opposite our Golf Club. Just a short cab drive will take you to Elliot Wright's plush restaurant and nite spot, Olivias, as seen on ITV's Palya in Marbella series. Calahonda is central to all of the attractions along the Costa Del Sol. Tivoli World (20 mins.) a major amusement park has an excellent “mini” amusement park in its grounds for the very young. Boasts a breath-taking cable car ride offering panoramic views of the mountains and coastline. There are two aqua parks within 10 and 20, minutes one in Fuengirola, the other in Torremolinos. African safari, out to sea dolphin safari’s, all within a 10-30 minute drive. Also excellent equestrian facilities nearby. Many people are surprised that the Costa del Sol in Spain also offers a wide range of winter sports, such as skiing and snowboarding near Granada in the Sierra Nevada mountain range only two hours, or so away from Calahonda, so you can book a ski holiday in the sun! Rental Prices: All our prices are fully inclusive, for the apartment, there is a small supplement for PAYG broadband & TV. Our property was chosen for its location & suitability for letting for the ideal family holiday. Location: Calahonda lies between Fuengirola and Marbella, with its own beach and beach bars, yet is near to Puerto Banus and fabulous Cabopino beach. An everything on your doorstep location, with Tax Free Gibraltar just over an hour’s drive and from there, ferry day trips to Tangier can be booked. John & Maureen live in Essex and have owned in Spain for over 19 years. We have rented our property to holidaymakers from the beginning and have many returning guests, so have plenty of experience. We enjoy socialising, golf, good food and drink. The time we are able to spend on the Costa del Sol allows us to indulge in all of these and more, along with our great neighbours and many friends we have made in Spain. We are happy to pass on our local knowledge to our renters with their personal preferences in mind. We viewed many properties for over a year or more before we bought, getting a good idea of what was on offer. The moment we set foot in Calahonda Golf complex we were smitten! The apartments were well established with a sound and well managed community.There are three pools in beautifully maintained lush gardens, we have eye candy views of the pools and the golf course. It was clear that the whole area was complete and that there was no possibility of new builds occurring, so the beauty of the area would remain untouched. The golf club and tennis club were just a couple of minute’s walk, as were, a couple of handy restaurants. Centrally placed on the Costa del Sol, it is easy to get to many attractions along the coast and there are several amazing beaches to choose from within minutes. Hand and bath towels are provided, please bring your own beach towels. Fully programable modern machine for your family loads. You can enjoy a superfast 100MB Fibre Optic Broadband and Wi-Fi with streamed TV with 166 channels including all UK and Freeview channels and stunning HD. A 42" wall mounted LED smart TV. Comfortable open plan lounge area with sofas, state of the art TV and wi-fi, bluetooth sound, you can link all your devices. There is a Blue Ray / DVD - CD player. This has USB input if you have your own films or music on MEM stick. Loads of CD's and bluetooth sound bar for connecting your own devices music library. There is a toy box on the patio, please feel free to have a poke round. Please don't forget tidy up time! There are many DVD's for all ages and tastes, or we are happy for you to bring any favourite's from home. Just two hour, or so drive to Sierra Nevada ski resort, Granada province You can hire equipment, buy ski passes and book overnight accommodation if you fancy. Please check resort seasons and prices. The apartment is situated in Sitio de Calahonda. The development has electronic security gated entry & lies between Fuengirola & Marbella in the Mijas province and is close to all amenities & major attractions on the Costa Del Sol. With La Siesta 9 hole golf course running past our patio & pool and over a dozen premier golf courses within 5 to 25 minutes drive. Shops, supermarkets, entertainment, restaurants & bars are 0.4 km & then a further 0.5 km to the beach & another selection of beach bars and shops/restaurants etc. Nearby are the towns of Fuengirola, Marbella, La Cala with plenty to do & see. Great property, exactly the location we were looking at, well kept place, smooth transaction with the owner. The owner was super helpful and communicated very proactively. Many thanks for the great review! I'm so pleased you had a good time and it's nice to be appreciated. Many of our renters book return visits, so please give as much notice as you can and it will always be a pleasure to help with your holiday accommodation and advice in the future. Small 2 bed apartment in a pretty golf course setting. Ideal for couples. located just a short drive to the coast and beach resorts. Good value. John is a great host and very helpful. A lovely apartment with great views . Lovely apartment very clean and spacious.The owner John Cassady was very helpful before I went and during my stay .would recommend it to friends and family. What a great holiday we have had! We had a wonderful relaxing holiday in Spain in this beautiful apartment overlooking the golf course and surrounded by lovely lush landscaped Mediterranean gardens bursting with colour and greenery and beautiful pools. A real home from home and very clean with some nice neighbours. The owner was extremely helpful and has great knowledge of local restaurants, golf courses etc. Shops, bars, and the golf course and tennis club are all within easy walking distance. I would definitely stay here again and would thoroughly recommend it. This is the third time we've stayed in John's apartment in the Calahonda Hills and there are many reasons why we will keep on coming! His apartment is allocated in beautifully appointed gardens with a choice of quiet pools. The HUGE benefit for the Costa Del Sol is the peace and quiet especially at night, although you're just a 5 minute drive from all the action on the coast ( would definitely advise renting a car, although taxis are readily available ) The gorgeous beaches of La Cala and Cabopino are 10 mins away by car. John makes bookings a doddle and is always available to help or advise. There is a choice of excellent tapas bars and restaurants just down the the road plus great markets and supermarkets if you're planning a night in on the lovley terrace. Thank you for the glowing review! Always a pleasure to hear from you. This is our second holiday in John's lovley apartment, and I 'm just about to book a third. 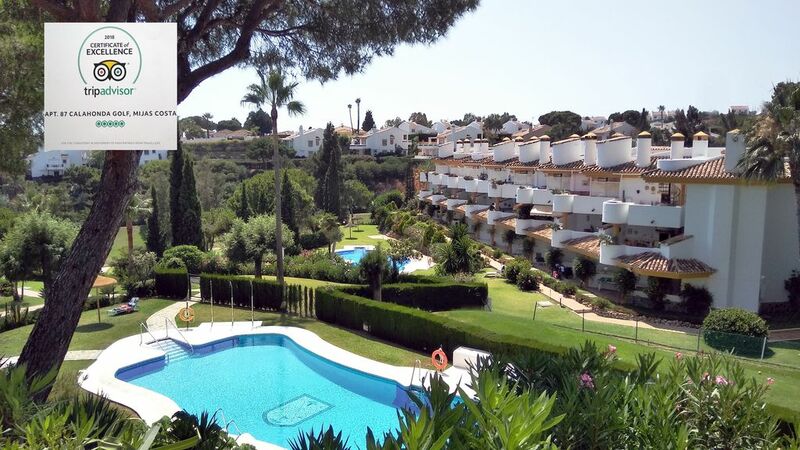 The apartment is set in the tranquil grounds of Calahonda Golf. Superb pools, close to really good bars and restaurants, and has most 'mod cons' The superb beaches of Late Cala and Cabopino are a short drive or bus-hop away. Highly recommended. Thanks for your kind comments! Looking forward to welcoming you again on your next and third stay in the apartment. Always a pleasure. Rent our apartment in Spain on the Costa Del Sol in Sitio de Calahonda. Just under 1 Km from beach. Lying between Cabopino and La Cala's beaches on the delightful Mijas coast. A typical Spanish resort with all amenities. Golf and tennis clubs on your doorstep, Clahonda’s beaches have awards for the safest beaches in Andalucia and have Spanish beach bars, ideal for those long and lazy sunny fish and seafood lunches. Enjoy the apartment's lush tropical jasmine scented gardens, with quince banana, & lemon trees. Midway between Fuengirola & Marbella and just 15km from Puerto Banus. With a 3 minute walk to the clubhouse for golf and the tennis club and is nicely located for many of the Costa's premier golf courses, around 30 within 5 - 30 minutes drive. There is a newly constructed 13 mile walkway from La Cala to Marbella running along the stunning beaches and bypassing many beach restaurants where you can have a fresh fish lunch, or just a coffee. At night the resort has a life of its own, not to be missed! Please scroll down and check that we have availability for your dates before sending enquiry and please scroll down to read the reviews of our renters, many of them give more information about the holiday! Golf: Our apartment lies in well established and immaculately kept Mediterranean gardens overlooking a fairway on La Siesta 9 hole, par 3 course. 872 m. In length. If you do fancy a quick 9, or 18 holes at very reasonable prices, It’s a decent 5 wood distance to the clubhouse and 1ST.tee The family can sit round the pool and watch you come up the 9TH. Fairway, and later, meet you for lunch in the club. Within 5 minutes drive you can access two 18 hole courses; the new Cabopino golf course and Miraflores and a short drive in the car offers the magnificent La Cala and La Quenta courses, as well as the wonderful 54 holes Mijas Golf Resort with 3 courses not, to mention over 30 other Costa Del Sol premier courses along the coast which are at your disposal. Many people are surprised to learn that the Costa del Sol in Spain also offers a wide ranger of winter sports, such as skiing and snowboarding. The number one location in Spain is in Andalucia, near Granada in the Sierra Nevada mountain range, only two hours drive on Costa del Sol. With 80km of ski slopes including 45 pistes and 6 off-piste routes, you can get around using the 2 cable cars, 12 chair lifts and 5 ski lifts. The pistes include Green, Blue, Red and Black runs.The resort is open 9am to 5pm, including weekends and bank holidays and also offers night skiing. Snowboarding has really taken off at the resort and there is now a snow park complete with jumps.The village at the resort offers a range of inexpensive hotels and Apartments for overnight stays, restaurants, shops and ski/snowboard Rentals. The season runs for four or five months of the year, but it is also a beautiful place to visit out of season. All rental rates are for the apartment are shown per week. Maximum 5 persons . TV and Fast fibre optic Broadband is pay as you go and a small supplement may be required. How to safeguard your £100.00 Security Deposit We expect the occasional glass or cup to get broken, so don’t panic if you have the odd small accident. Our housekeeper will service the apartment after your stay to make ready for new guests, so please leave it as you found it. You only need observe the few rules when vacating, as below. 1. Ensure ALL rubbish / unwanted items/food are removed in bags to the large council bins out in the road. 2. See to it that All dishes and pots and pans are washed clean and put back in cupboards. 3. Any debris, things you have bought and labels and wrappers, etc. are removed. Please check under beds. 4. All used bed sheets and linen for laundering placed in the bath. 5. Use your own towels only for beach or pool. Ours must remain in the apartment. 6. If you do have an incident report it to me. 1st. hand information is most the valuable. When you leave, please lock and secure the empty apartment. When you get home ensure that our keys are posted back to us immediately in strong wrapping to the correct address. Once they have been received your deposit will be released. We are not responsible for, nor can guarantee the return of, any personal belongings left in the apartment after your stay. If you would the apartment serviced during your stay this can be arranged in advance at extra cost.